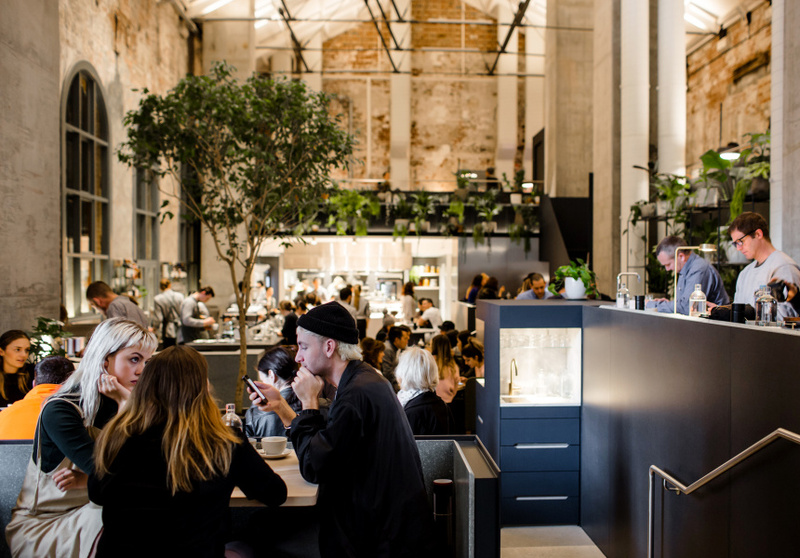 From former warehouses to cosy bars and sophisticated dining rooms, a swathe of Melbourne venues double as awesome event spaces. Here’s a guide to some of the best hidden in plain sight. Melbourne does events well. If there’s not a festival on every damn week, there are daily gigs, shows, performances and reliably wonderful eats and drinks stretching into the early hours to make every foray into the city feel like a special event. That’s compounded by hundreds of prime venues that double as event spaces for hire. 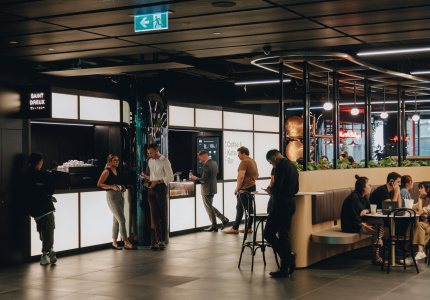 Whether you’ve a wedding, birthday, party or work function on the horizon, here’s a selection of the best spaces to take over and call your own. 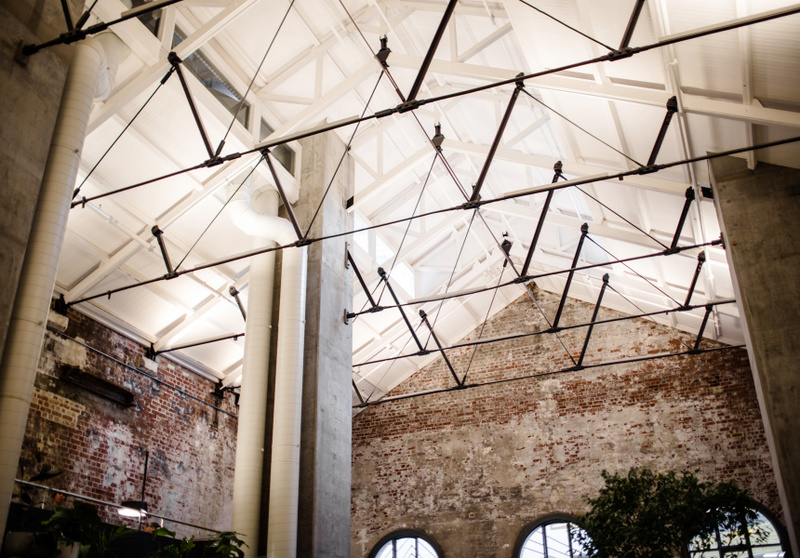 Once a power station at the Spencer Street end of the CBD, the high-ceilinged Higher Ground is somewhere between a restaurant, bar, cafe and grand hall. Inspired by the all-day bustle of boutique hotels in London such as Ace Hotel in Shoreditch and Soho House, its high-vaulted ceilings allow light to flood in during the day, and lend an air of grandeur in the evening. Potted ferns and dividers cleverly turn the stylish multi-level space into a series of nooks through the large space. Seating is four to a table and chef Paul Bongiovanni offers three menus. Breakfast includes a dish of minced lamb with miso eggplant, fried eggs, dukka and smoked-yoghurt eggs. And the evening menu is dominated by meat and fish with locally sourced vegetable sides. A specialty coffee menu keeps black-clad waiters busy during the day, and bespoke cocktails are served by night. For events the menu includes canapés, both cold and hot; pickled and whipped fish; poached chicken; and fresh vegetables, alongside larger offerings. The space regularly hosts weddings, functions and private parties, and those multiple levels can accommodate up to 120 guests for a sit-down event or from 80 to 300 guests for a cocktail or standing function. 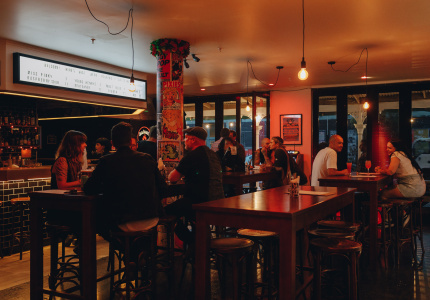 This grungy bar in a converted warehouse in Collingwood hides a smart interior. Its owner is Laura Twomey, formerly of City Wine Shop and French Saloon. Exposed brickwork and a neighbouring motorcycle repair shop add to the charm of the rustic beer garden, pool room and bar ensemble. 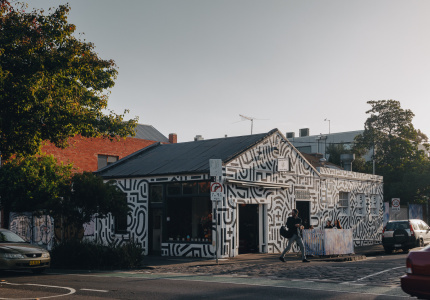 Street art and sneakers adorn the wall outside and the interior is built around green booths, stools and a handmade Victorian ash-timber bar. 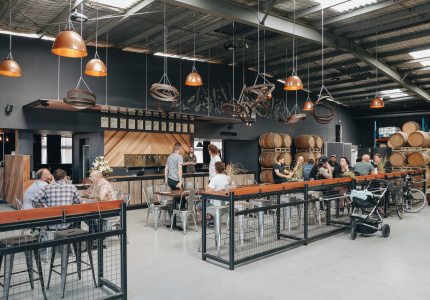 The motorcycles, metal work and bespoke fittings give the main bar a personal, communal vibe, and there are three eatery options in the venue. 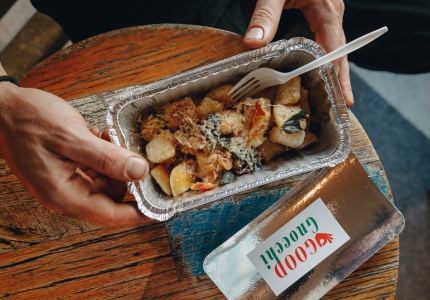 Guests can sate their hunger with South American specials from Latin Lucy; cured-duck tacos from La Tortilleria; or cold cuts, toasted sandwiches, pastries and three types of roasted coffee from deli Casati’s. And a microbrewery built by deli owner Peter Casati adds signature beers and ciders to the menu. As an event space Paradise Alley is ideal for those who want to get casual and convival (in the presence of excellent tunes) but still be looked after with premium food and drinks. There are three different hire spaces here – the lounge room, pool room and dining table, and it takes bookings for groups larger than 10. The rough brickwork of the entry archway to South Melbourne’s Half Acre belies a sleek glasshouse dining area under a stunning white roof of Oregon pine. Here owner Adam Wright-Smith, formerly of The Fat Radish in NYC, along with partners Asaf Smouli and Leigh Worcester, run a celebration of contemporary, seasonal cuisine over a charcoal fireplace. 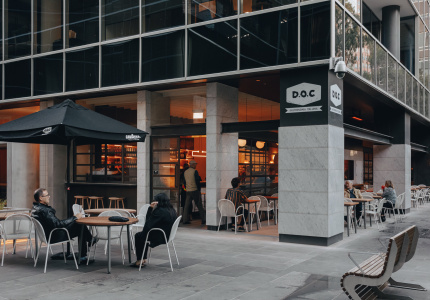 Half Acre 's menu gives emphasis to vegetables, such as grilled cabbage served with torched goat’s cheese and a drizzle of chimichurri, while perfect Scotch fillet shows a mastery in charcoal-cooked meat. Up to 75 seated guests can dine in open-plan splendour, framed by sliding doors and timber. Despite the large scale, several smaller settings within the space allow for intimate gatherings. As a hire option, the space turns modular depending on your needs. Seated capacity is 264, but if you want to use the dance floor make it 220. Both cocktail-style and theatre-style conference capacities are 400. 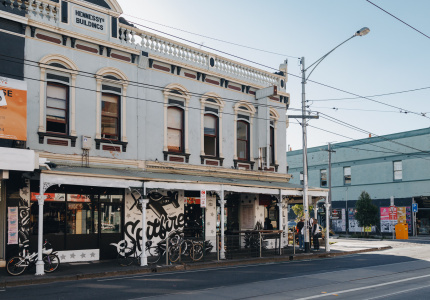 When Bar Romantica rose from the ashes of Cafe Romantica, a 30-year party, pizza and pool institution in Brunswick, expectations were high. 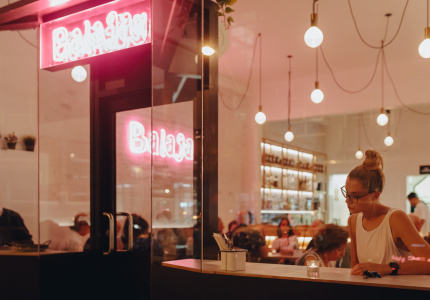 The much-loved 24-hour cafe set an inclusive standard in nighttime trade, and Bar Romantica has respectfully expanded that legacy into a smart Italian-inspired eatery. Co-founder Monty Mullooly-Hill describes the update as “no gimmicks, and a lot of wood – a comfortable old-world fit-out”. He’s right. The venue’s generous size retains the comfort of a smaller space. Deep wooden booths and plush red cushions turn wall seating into a private affair, art-deco lamps provide low-key ambience, the wooden archways and speckled terrazzo floor create a classic finish. Framed by a line of red stools, the corner bar alone could be cut from a Martin Scorsese film. 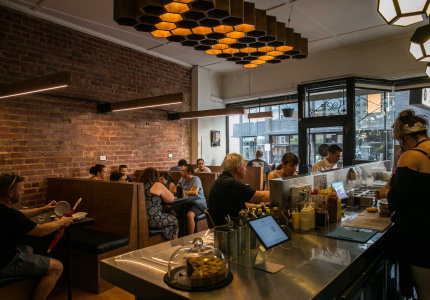 The restaurant is typically open from 4pm to “late”, and ingredients are local and seasonal. Though the menu changes daily, Bar Romantica offers affordable salumi, pizza, pasta and vegetable sides alongside Italian takes on steak, eggplant and fish dishes. Bar Romantica is available for hire on Sundays, Mondays and Tuesdays for groups of any size up to 100. AU79 is the chemical and atomic number for gold. 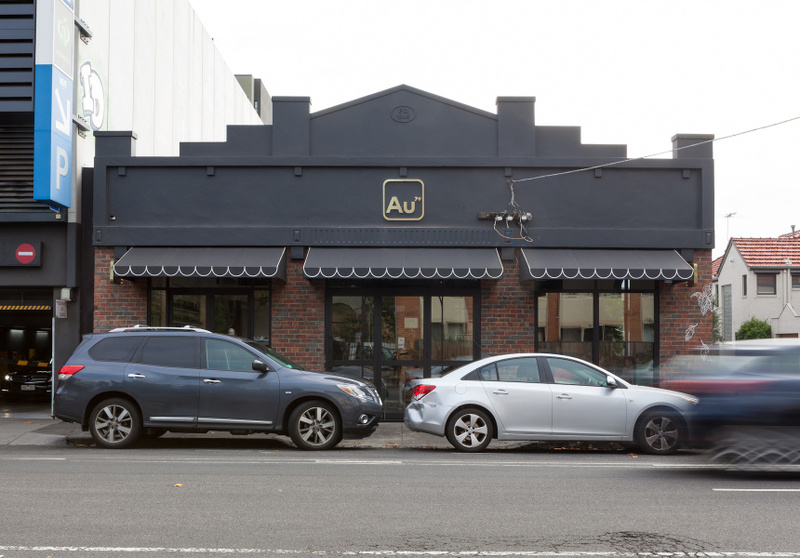 So it suits that the team behind this plush Abbotsford cafe has put the midas touch on a reimagined garage. The Coffee Culture Communications Group has prior form with Loco Coffee, Liar Liar and Sir Charles. 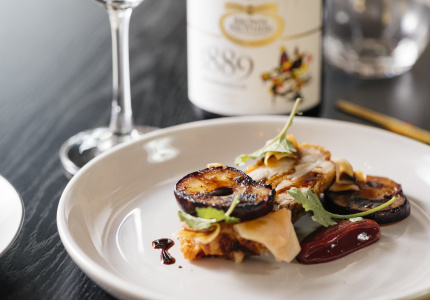 And at AU79 it pairs signature brews with Asian, Italian and American-influenced dishes for breakfast and lunch. Think fresh breads, waffles and pancakes alongside confit duck bao, daikon kimchi with ssamjang mayo, salmon rillette on toast, and kale and corn fritters. The drinks menu involves berry smoothies and vegetable juices alongside a comprehensive coffee selection. On that: AU79’s self-contained roastery produces the house blend, which is served alongside international single origins. Though 80 seated guests fill the cafe during opening hours, AU79 can accommodate up to 200 people for cocktaill events, or 150 guests in a private back area. Important tech spec: there’s a fully functional dance floor with adjustable spotlights.